IKEA have recently launched their most sustainable store in Greenwich, London. The store includes a range of green features, such as solar panels and rainwater collection systems, and will have a roof garden open for use by the local community. It was built from renewable construction materials and even boasts a range of sustainable furniture. And panic not, there are a range of delivery options are available at the store, including 24-hour delivery for those living in Greenwich and a bike courier service. So you won’t have to haul your Billy Bookcase on the Jubilee Line. Working with The Royal Borough of Greenwich, the store has also been designed to encourage sustainable travel via public transport, rather than private cars, there are also charging points for electric vehicles and covered cycle bays on the site. All in a bid to further reduce IKEA and its customers’ carbon footprints. To promote this sustainable travel initiative, IKEA have found a media first. 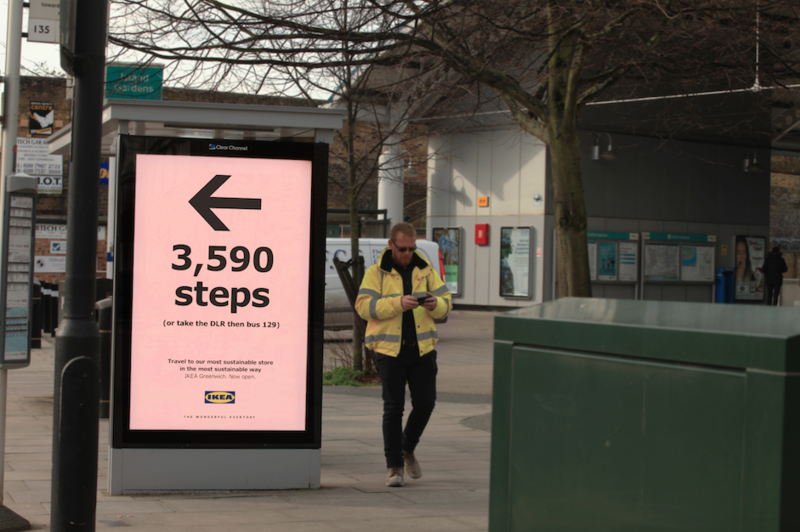 The outdoor media campaign across South East London takes advertising sites across the area, repurposing them as directional signage towards the new IKEA Greenwich. Marrying the IKEA philosophy of design function for its products, each poster site is unique, offering exact footsteps and direction to store – measured by walking between each poster site and IKEA Greenwich’s front door. Plus, there’s a handy public transport route, provided by TfL, if they don’t have the stamina. There are 80 sites in total and, unusually for an outdoor media campaign, they will be live for the next six months, allowing directions to IKEA to become well-known in the local area.